PRODUCT DESCRIPTION: Glue trap which uses sexual pheromones as attractants and is set out where you either have activity or suspect activity. Emerging adults will find the trap, enter and get stuck on the glue catching them before they are able to mate and lay eggs. Excellent monitoring device which should be used in conjunction with the other treatments listed in our on line article. As seen in the picture there are two styles of this trap. 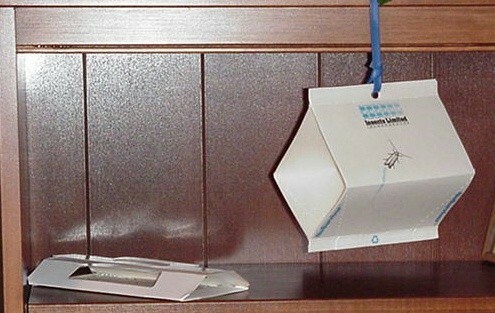 The one on the left side of the picture is the Low Profile, and the trap on the right side of the picture is the Hanging Style. WHERE TO USE IT: Anywhere in the home where activity has been found. 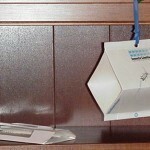 The Low Profile design is good for use in cabinets, bookshelves and pantries. The Hanging Design should be placed in more open areas where adults have been seen flying around.